I'm not a big fan of going shopping on the weekends. There's the crush of people all clawing and shoving at each other, there are the legions of welfare mums with five prams each, and little old ladies doddering about everywhere in front of you. Sadly my work shoes exploded on me so I was forced to run the gauntlet of Birmingham City Centre to find replacements. My shopping trip brought me to Poundland (no, I wasn't going to buy shoes there, god). Poundland is a cheap UK shop where everything costs a pound, surprisingly enough. It is usually full of the lowest of the low, the chaviest of the chavs and, well, me. Looking at their toy aisle for exciting knockoffs to write about, I was saddened to see that their 'Armada Optimus Prime Squad' line of toys was no longer in stock. What they did have however, was a set of gigantic Multiforce knockoffs! Wresting the chewed cards out of the hands of screaming children, I took my prizes and ran for the exit! 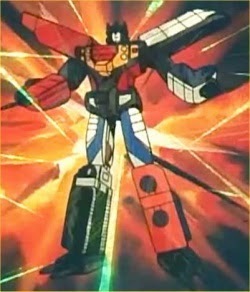 Multiforce was a line of Transformers released in Japan as part of the Victory line in 1989. Together they formed the gestalt Landcross. Now, Multiforce were small. Very small. So small in fact that they were pretty much Micromasters and indeed were sold as such in the reissue line. I was rather excited, therefore, to see each of these knockoffs was roughly the size of my hand. Buying knockoffs is always a bit of a Russian Roulette, Transformers even more so. Because of the sheer amount of pushing and pulling needed to transform the things, Transformers need to be made from durable plastic, not the sort that crumbles the moment you remove it from the package. But I'd never owned a Landcross and at a princely sum of six quid, I wasn't going to turn my nose up at the offer. Whilst the back of the packs didn't explicitly mention that they robots DID combine (most companies like to take shortcuts by removing features) the fact one of the packs came with a giant head reassured me. The card seemed to indicate that my Landcross would somehow magically merge into a chrome Bruticus with giant arms, sadly this was not to be. Everything seems to be there, from the crotch plate to all the guns. Sadly it was immediately obvious that the guns didn't fit in any holes - they were there for show only. These were obviously a pacifist Multiforce squad. The colours are also a bit off - you can see the original Landcross over at TFU.info. But for a pound each, I wasn't going to complain. You might note that they don't really look that impressive. Remember that these are not only vastly scaled up versions of some tiny toys, but also from 1989. There is a field of thought that thinks all Japanese-made Transformers are automatically awesome, and that the only reason Hasbro didn't bring them over to the West was that they were evil and hated fun. This is untrue, unless your name is Movie Screen Battle Barricade, in which case Hasbro does hate you and guts your features for no reason. Multiforce are interesting, but they're not perfect and need to be viewed in context. There's a reason they weren't brought over, and that's not because Hasbro hates fun or making money. Dash turns from a rather decent car into a robot with hilariously large feet. I cannot get over how stupidly large these feet are. Multiforce are very gimmick-heavy - the six robots can each combine with each other to form three larger robots, and then also merge into the gestalt Landcross. Since originally they were tiny, there were a lot of concessions that had to be made, and rather awful robot modes is one of them. For a line that is primarily about robots, this wasn't the wisest choice. Dash, like the rest of his friends can't hold his gun, but his car mode CAN attach his combiner kibble as a weapon, which none of the others can do (due to holes made too small). Mach is a space shuttle. A purple space shuttle (oddly the knockoffs colours were switched from the original, which was mostly white). However given that the original Transformers series featured Blast-Off, a grey attack-shuttle, and Astrotrain, a white and purple shuttle, I can't really complain. Again the robot mode is awfully goofy, especially at this inflated size, but the actual plastic used in making him isn't that bad. It isn't Hasbro-quality granted, but Multiforce require a lot of twisting and turning and have little flip-out bits for merging and the plastic is good enough to actually not crack or strain at the slightest motion, which is nice. Tacker is... Christ knows. A military transport of some kind? He is covered in stickers in an attempt to give some life to his horrendous alt-mode. Incidentally the original is even worse, which just yellow front windows. At least there's some logic to the plastering of stickers all over these guys. You can see that someone at the knockoff company was staring at this guy and at least trying to force him to make sense. Most of Multiforce have got rather interesting alt-modes, but like Tacker, Tackle is just... a bit crap really. At least the orange and blue add a bit of interest to an otherwise dull mode. It is possible that I mistransformed him slightly, but the bow-legged look is what TFU.info told me to do, and I trust that site! I'll take this opportunity to just say that while these guys are plastered with stickers, they have a nice amount of paint - all the faces are painted, and when I say painted I mean painted properly not just a gob of silver smeared across the general direction of the face. Even the gestalt parts are painted. Sure, they don't all clip together easily, but they look better than they should. I like Waver - he's some sort of hydrofoil, but detailed enough to actually be interesting at this size - his boat-legs can twist up or down, his propeller at the back turns, and he even has some of the flip-out poles needed for the combining. Sure, he's still goofy but in the kingdom of the blind, the one-eyed man is king. Speaking of blind, Wing is probably the worst of the lot. He looks more visually interesting than some of his fellows, but he is floppy as hell and some mold residue stops one of his arms from moving fully (yes you can cut it off, but you shouldn't need to). He's also a pretty poor plane, but at least he isn't another van. Okay, so that is Multiforce. But wait, there's more! These six firm friends can also combine with each other to form some sort of two-man combiner robot. The gimmick is that each can combine with the other, becoming either the top half or the bottom half, and so each has another head that comes out of their bum. In a nice touch, this head is also fully painted, something I expected the knock-offs to skip. Here we have the various robot modes of Dashtacker, Machtackle and Wingwaver, along with a little Legends Bumblebee for scale - remember these guys are oversized, which is easy to forget if you don’t look at them in context. They look slightly more in proportion in these modes, and the plastic used doesn't break which is rather nice, since they involve a lot of snapping in clips. Some of them have molded arms, some of them don't. Technically they can all combine with each other, but I'd be here all year if I was to make every combination. The play value is rather impressive though, and a forerunner of the energon combining. Here is the main event, the thing you've all been waiting for - what is Landcross like? The packaging promises me a shiny Bruticus, but he does come with Landcross parts. Rather impressively, it all clips together solidly, and doesn't shatter as I feared it would. There are no instructions to turn him into his combined mode, so it took a bit of squinting at online pictures. Landcross isn't perfect. Dash doesn't have a hole in his hand for the right hand, so I had to carve a space for a little hole. The wheels on Mach stop the chest-piece going in fully, and the entire robot has to rely on Waver's arm joints to not topple over. There are also the problems of the original, which is that he is gimpy and his arms come out of his chest. But he is surprisingly solid for a knockoff, quite satisfying, and big. He's big. He's really big. He's bloody huge in fact. He's easily as big as Armada Unicron, and the only reason I don't have a picture of that is that every time I touch Unicron, he shoots me in the eye with a missile. But here's an image of Landcross, Universe Prowl and Legends Bumblebee for scale. Landcross is BIG. I can't say this too many times, he will crush your SOUL. To sum up, he is very nice. Don't get me wrong - he's still a knockoff with poor quality control, can't hold his weapons and not the best plastic, but he isn't the total wreck I was expecting. If you want a huge version of a rare Japanese Transformer at a bargain price, you really can't go wrong. That is indeed Emirate Xaaron. I boggle in amazement and wonder. So when's the update where you smash it with a hammer!? Where did you buy it and how much did it cost? Randomly, my work shoes also exploded on me a couple of weeks ago. Luckily, I work 10 minutes from the town centre so I didn't have to battle my way through hoards of screaming children to get replacements. I...have nothing to say about the transforming thingy. No. Bonecrusgher hates you. Unicron just DEMANDS THAT YOU SUBMIT TO HIS GODLY MAJESTY, INSECT. I bought one of those. You sold me it, I think. It's pretty damn cool, if you ask me. Ace! Yeah, I sold both of them. It's great isn't it. Not perfect, but solid and very impressive when combined! gosh.i wish i can find those here in my town. Little Matty Boy's Comics - CRUMBLE! Icewind Dale - The Ultimate Walkthrough!